I'm a big fan of Howe Sound, their 1L jugs are perfect size for a get-together and great for home brewing. Their King Heffy Imperial Wheat Ale is probably my favourite summertime treat. Right now they have something like 4 different beers available here in Manitoba, and I haven't had time to try them all. 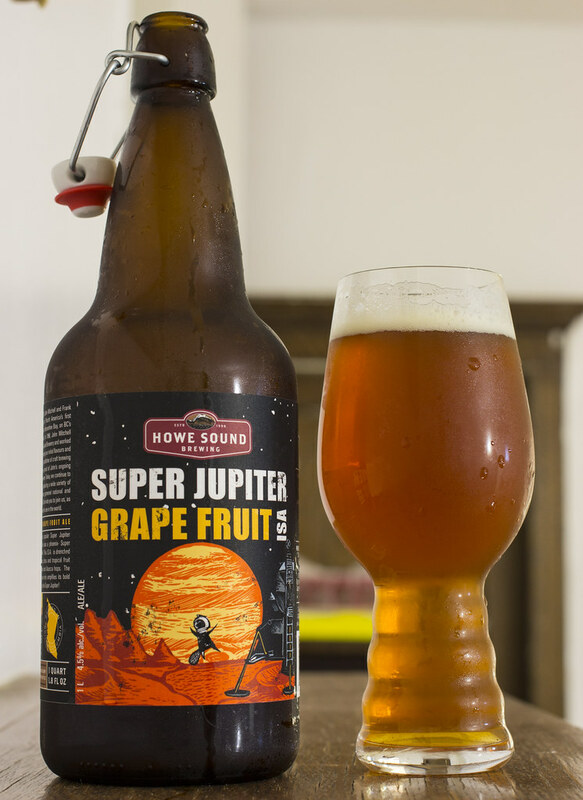 Today's review is Howe Sound's Super Jupiter Grapefruit ISA. Super Jupiter tops out at 4.5% ABV, so I'm assuming the ISA = India Session Ale, which isn't a style at all. Appearance: Super Jupiter pours a colourful caramel-amber, light hue of copper, somewhat cloudy. The head is beige and creamy, diminishes fairly quickly so I don't have to wait for it to die down to start sampling. Aroma: Notes of grapefruit, pine, lemon pledge, doughy yeastiness, lots of tropical notes in there including more grapefruit, some pineapple and a bit of a syrupiness to it. Fairly sweet yet there's a decent amount of bitterness of pine in the hops. Taste: It's a malt forward beer at the beginning as I'm noticing notes of caramel followed by a hint of grapefruit, pineapple and lemon. The hops give it a bitter and somewhat leafy flavour to it, notes of pine. I was expecting more of a bitter grapefruit flavour, but the grapefruit is rather mellow in this beer. Overall Thoughts: Very easy to drink, a malt forward beer with compliments from the hops. For a beer with "grapefruit" right in the name, I was expecting more grapefruit zest. Edit: Not to be confused with Super Jupiter Grapefruit India Pale, which I reviewed a few years back.